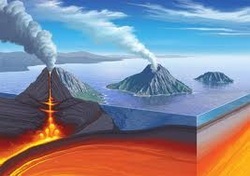 Subduction is the process that takes place at convergent boundaries by which one tectonic plate moves under another tectonic plate and sinks into the mantle as the plates converge. A great example of this is how the Juan De Fuca Plate is moving under the North American Plate, which created the Cascade Mountain Range in North America. The Cascades are considered active volcanoes. The Andes Mountains in South America are also caused by a sub ducting plate. Orogenesis (mountain building) refers to forces and events leading to a large structural deformation of the Earth's lithosphere (crust and uppermost mantle) due to the convergence of tectonic plates. An examples of how mountains are built through continental crust convergence is the Himalaya Mountain Range. Continental Volcano Arcs are chains of volcanoes positioned in an arc shape as seen from above. Offshore volcanoes form islands, resulting in a volcanic island arc. Generally they result from the subduction of an oceanic tectonic plate under another tectonic plate, and often parallel an oceanic trench. Volcanic Island Arcs are a chain of volcanoes, with arc-shaped alignment, situated parallel and close to a boundary between two converging tectonic plates. Most of these island arcs are formed as one oceanic tectonic plate subducts another one and, in most cases, produces magma at depth below the over-riding plate.